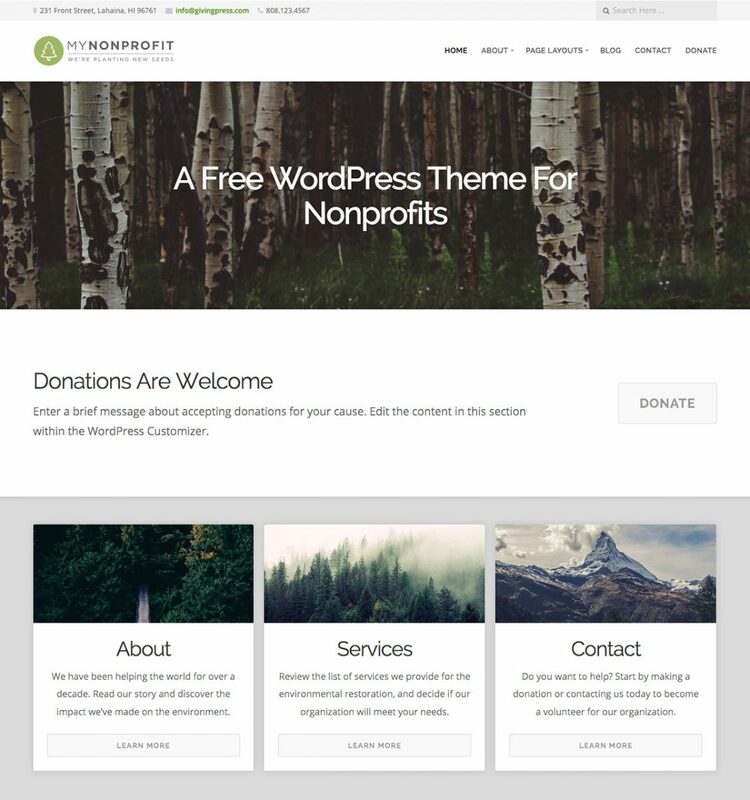 The GivingPress Lite theme an excellent free starter WordPress theme for nonprofit organizations. 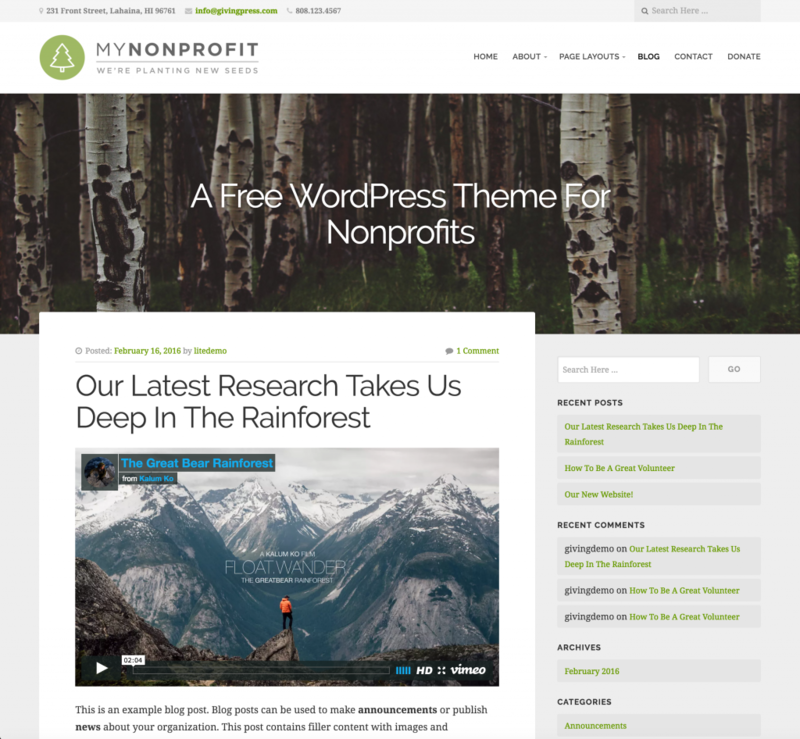 A free WordPress theme for nonprofit organizations. GivingPress Lite is a simplified version of our GivingPress Pro theme, and available for download in the WordPress theme directory. GivingPress Lite is professionally designed and developed by our experienced team. The code is well documented with commenting throughout the files. The design features a responsive framework that looks amazing on any mobile device. 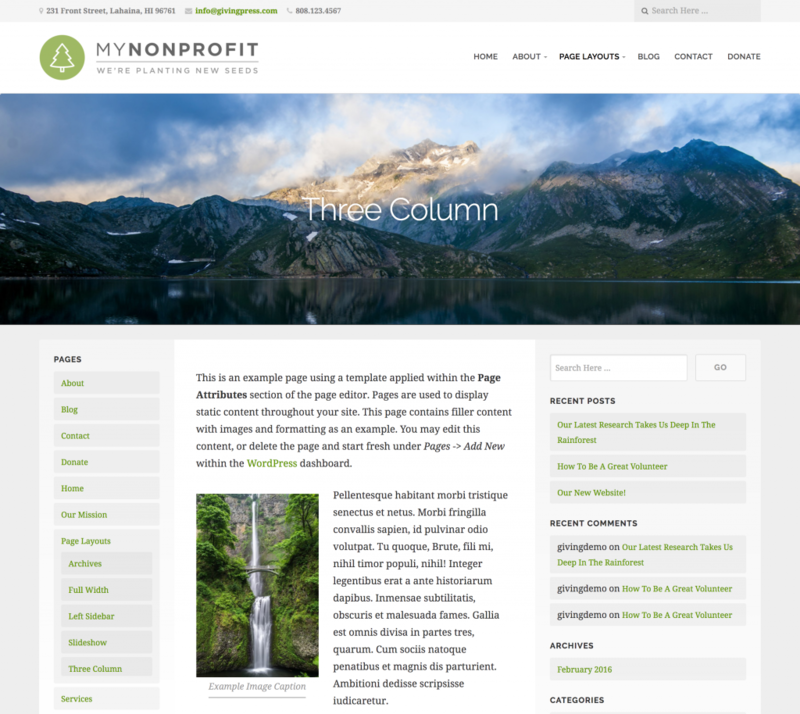 The theme is an excellent starter theme for nonprofit and conscious business websites. It can be installed easily with any self-hosted WordPress installation. 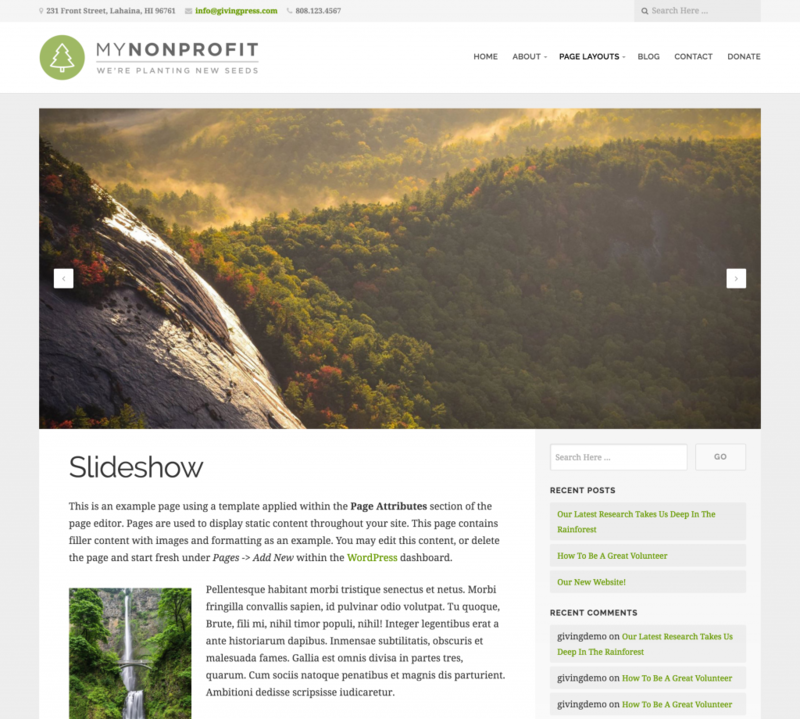 The theme features multiple page templates for displaying content in a variety of layouts. The WordPress customizer can be used for setting up the home page, adding your logo, contact information and more. The donation button can be linked to an external donation service, such as PayPal. The theme features all the latest WordPress functionality including the Site Logo, Favicon, Featured Images, Custom Menus, Custom Header, Widgetized sidebars and footer, and more! In addition, GivingPress Lite has implemented custom “starter content” that was introduced in WordPress 4.7. Meaning, upon a fresh installation the theme will appear as it does in the demo with example content that can be used as a guide. The starter content provides a smooth and simple setup experience. Our goal at GivingPress is to provide a great web presence for all nonprofit organizations, so they can focus on making the world a better place. GivingPress Lite is our free contribution to making that goal a reality. The theme is continually updated and maintained within the WordPress directory. Although we cannot guarantee support for a free product, we regularly answer questions regarding the theme in the WordPress support forums. 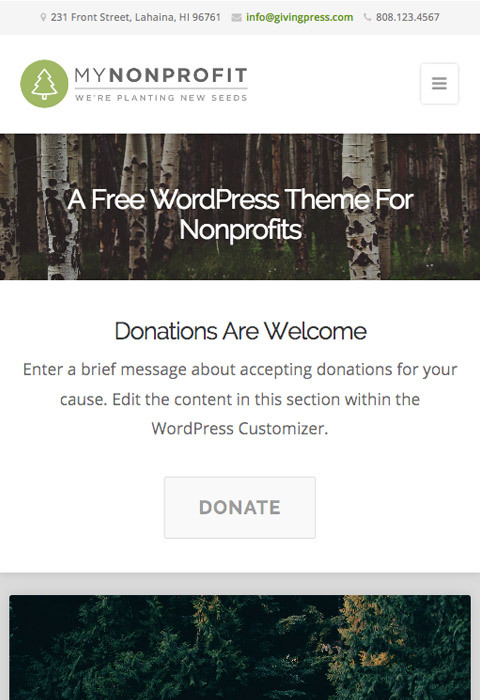 Download GivingPress Lite today for your nonprofit website! If you like the GivingPress Lite theme, please take a moment to leave us a review.